We all know that time flies when you're having fun. But as a dog owner, I can also confirm that time also flies when you're cleaning up a kitchen floor strewn with garbage, walking seemingly endlessly through the neighborhood when the temperature is cold enough to flash-freeze small birds in flight, or waking up to the sound of a little four-legged being quietly throwing up at your feet. Ah yes, dog ownership is a trip. And today we mark eight years of it. On this day in 2007, we brought Frasier home. He was a rescue from a home where his "normal" was a too-small cage and not much else, and after spending the first months of his life mostly alone and afraid, he very quickly became one of us. This isn't a fairy tale, mind you. He was, is and presumably always will be less than convenient. Between the garbage, the weather and the horking up, he is as labour-intensive as he sounds. He's diabetic, too, so insulin shots and eternal worry are now part of our family vocabulary. And speaking of sounds, he is no stranger to them. Loud is his middle name. I know it's a miniature schnauzer thing, but still. I was once walking Frasier with a member of our extended family who shall remain nameless. As usual, Frasier was wandering like a bad drunk from side to side, following his nose wherever his DNA deemed worthy. Pulling on the leash didn't seem to do much good, and I lost count of how many times I had to physically move him in the direction I wanted him to go. Of course, distant-family-member-guy's dog was infinitely better behaved. And he proceeded to lecture me on all the things I was doing wrong in training - or, I'm guessing, not training - our dog. He then explained why a dog from a breeder is better than a dog like Frasier, "Where you really don't know what you're getting." I bit my tongue at that one. Hard. I think it even bled a little. Didn't say anything to him as we continued our walk and returned to the house. Because I think we have very different definitions of what "better" is. We may not have known what we were getting when we brought this little troublemaker home. We may have been taking something of a risk given what he had been through. He sure didn't end up as the perfectly trained, breeder-supplied, by-the-checkmark ideal that seems to occupy centre stage in the Christmas card scenes of so many families. But he's ours. With a kind heart that defies description. And a way of connecting with us no matter what we're going through. So we'll take him, warts and all. After all, he decided long ago that we were his, and I'm not about to disagree with him. Thank you for eight wonderful years, you furry ball of insanity. May we all be lucky enough to have many more together. Thank you for adopting a throw away dog. Frazier thanks you too. He's a proper dog who has been repaying you for picking Him. You aren't alone, I too started biting my tongue... unbelievable how people think they are giving good advice... I bet Frazier is forever grateful that you all decided to make him yours. Animals know, believe me. 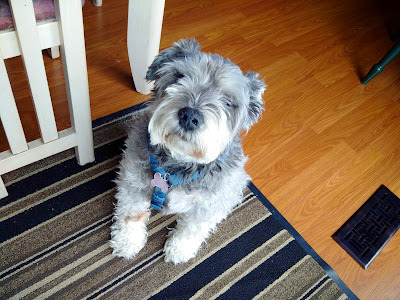 You know we have a schnauzer also, Max is a bit over 6 years old and we adopted him from a breeder, we took puppy lessons and spent an enormous amount of money for two weeks of boot camp training for him and us. All our bathroom and bedroom trash bins are placed out of his reach, on dressers, in the bathtub and he greets any and all visitors so loudly we can't hear each other! We love him, he makes us laugh every day and we take him everywhere with us. Frazier looks gorgeous, 'bad' habits or not! Rescue dogs are so worthwhile - our second dog was so nervous at first, though he had not been ill treated or anything - his owner had to go abroad and had taken him to the rescue kennels. But he gave us so many years of fun and laughter and proved no trouble at all. Third and present dog was re-homed from ex-son-in-law but is a Cocker Spaniel and SOOOO greedy it isn't true!! You'd think we never fed him!